Activist investor Carl Icahn has dropped his proposal for eBay to spin off part of PayPal, ending a nasty saga that had both sides fuming. Though Icahn's proposal will no longer be presented to shareholders at eBay's annual meeting next month, Icahn hasn't completely backed down on his idea of eBay selling off its payments business. "I continue to believe that eBay would benefit from the separation of PayPal at some point in the near future and intend to continue to press my case through confidential discussions with the company," Icahn said in his statement about his deal with eBay. In return for Icahn's agreement to drop the proposal to shareholders and withdraw his two nominees to the company's board, eBay (EBAY) agreed to appoint to David Dorman, founding partner of venture capital firm Centerview Capital Technology, to the board. Dorman was CEO of AT&T (T) when the company merged with SBC Communications and was also chairman of Motorola's (MSI) board when that company split into two separate businesses. "As chairman of Motorola, Mr. Dorman ... guided the company through the successful separation of its mobile device and home businesses, which greatly enhanced shareholder value," Icahn said. "We are happy to have reached this détente with eBay and believe that Dave Dorman will be a great addition to the company's board of directors." But Dorman said he won't look to shake things up and that he is committed to "helping drive growth for PayPal and eBay together." Icahn said he has met with eBay CEO John Donahoe several times over the past week and found a number of his ideas to be "extremely compelling." He said he'll continue to speak with Donahoe when the CEO visits New York. EBay also said it will allow Icahn to continue discussions with the board. 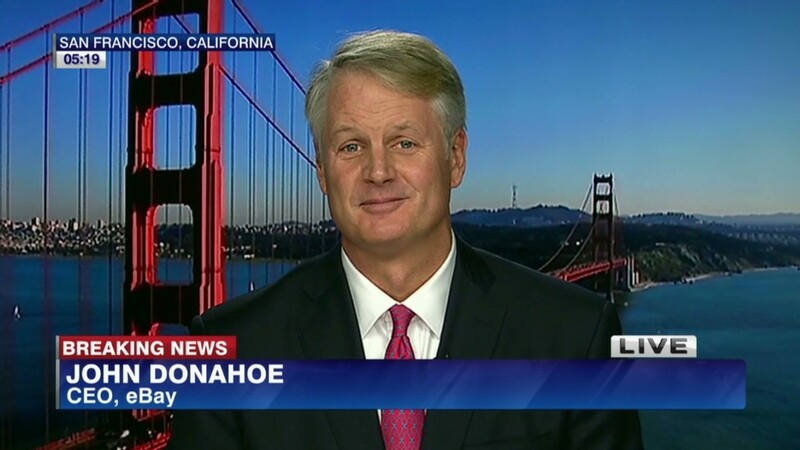 "This is a clear win-win for shareholders," Donahoe said on CNN International's World Business Today Thursday morning. "Carl saw the real long-term opportunity of keeping our company together." Donahoe said he continues to believe that the best path forward for eBay is to keep PayPal completely under its umbrella. "That's the best path to grow shareholder value," he said. "If that changes, we'll pursue that." Icahn first proposed that eBay split off PayPal back in January. Icahn subsequently accused the company of mismanagement, and alleged that there were conflicts for two board members: influential venture capitalist Marc Andreessen and Intuit (INTU) co-founder Scott Cook. This is the second time this year that Icahn has relented in a fight against a big tech company. He had been pushing Apple (AAPL) CEO Tim Cook to do a bigger stock buyback, but he backed off from that push in February.